Sterling Systems & Controls, Inc. has announced its line of bulk bag unloading systems that are highly custom engineered and manufactured. They can include many special features, such as material weighing and batch dispensing, system controls required for automatic operation, bag hoist, bag massagers, a variety of valve types, dust containment and much more. Sterling Systems & Controls, Inc. offers a full line of Bulk Bag Unloaders that incorporate many of the same structural aspects as our micro, minor, and major ingredient weighing systems, but are specifically designed to unload or discharge a bulk bag, typically into a fixed hopper within your system. Bulk bag unloaders are customized to meet the specific needs of each customer application. Solutions are often provided to unload bulk bags of dry bulk solid materials and directly fill supply bins such as drums or tote tippers. 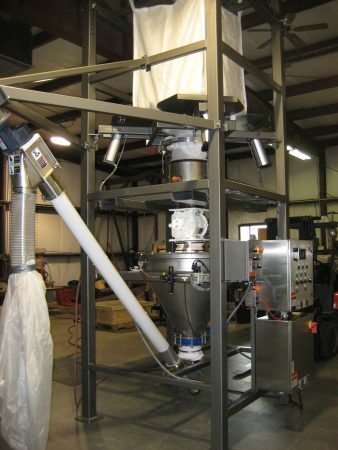 Whatever your application requires we will customize a bulk bag unloader to meet your specific requirements. Floor Mount or Through-Floor Mount.